Steve The Sheriff is rated 3.7 out of 5 by 24. Rated 5 out of 5 by stonedragon44 from Steve the Sheriff Completely entertaining. Also loved the sequel. Rated 5 out of 5 by PriceOfPoker from Looks too simple but it is a lot of fun Sometimes you do not want to be intense. Sometimes you just want to have fun. Sometimes you want to have a challenge but not worry about ghosts and goblins. Sometimes (most of the time) this is the game for you. The dialog between Steve and his wife alone is worth it. Rated 5 out of 5 by cicina54 from Steve The Sheriff I like non-violent G-rated games I can share with my Grandchildren. This is exactly what i was looking forin a game! Now I have a game I can share with them that I enjoy as well! Thank you! 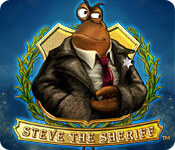 I also have the 2nd game called: Steve the Sheriff 2-The Missing Thing! I liked it a lot. 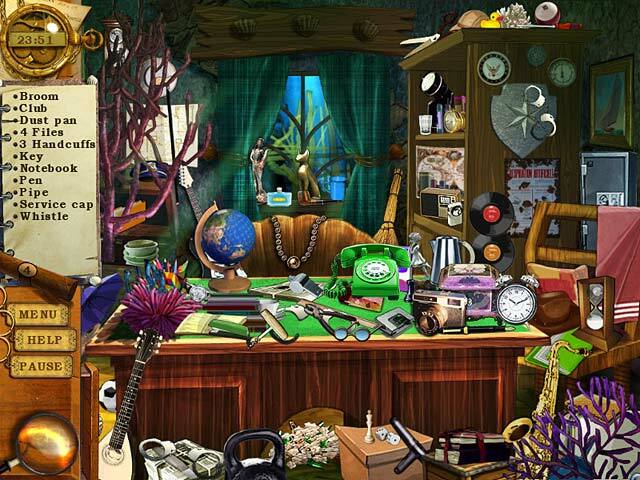 I have many Hidden Object Games. But this is one I can play with my 8 year old Grand Daughter! Rated 5 out of 5 by Gameritis50 from Playing this first of 2, is a must!! 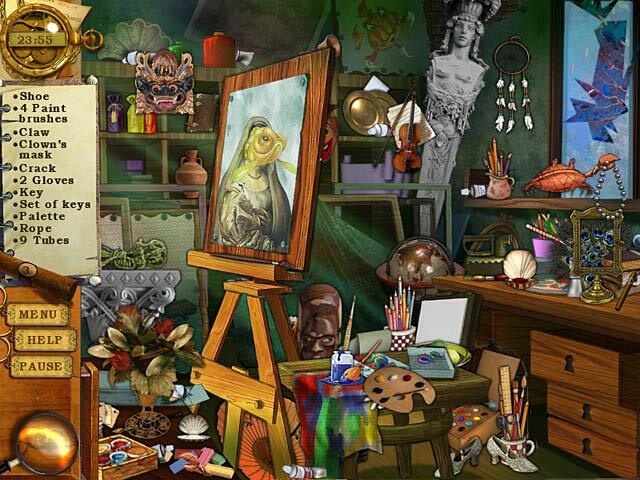 This hidden object game came as a complete surprise, when I began to play. Cute, as well as challenging. 2 things of interest, pay attention to bubbles, and some items are very tiny. Have fun and don't forget the cigars. Rated 5 out of 5 by midnyteblue from Steve the Sheriff The game was fun, different then the usual Hidden object games. It has a good story line, and it is not easy. Rated 5 out of 5 by sereneorchid from Light-hearted mystery under the sea Marvelous graphics and a really entertaining crime mystery under the sea. You and the sheriff find clues while searching for hidden objects in different locales in town. Mini-puzzles pop up as part of each HO scene, and are fun to complete, but it's nice that you can skip them, too. In order to acquire more hints, you have to find the sheriff's cigar in each scene. A clever twist! In between HO games are "find the differences between two scenes," where clues are also to be found. A wonderful game that truly deserves its 5 stars. Rated 5 out of 5 by kat10 from Just plain old fun! Loved the game. Fun enough to keep me interested. Good mini games, good HO scenes, cute characters. Love the look on Sheriff Steve's face when he's happy about something =) Would be fun to play with kids. It's not going to tax your brain but after a long day at work I play to unwind and have fun. This game fits the bill perfectly! Rated 5 out of 5 by donal24 from Keep You On Your Toes Hidden Object Game !!! You will never be bored with this game, while trying to find objects you also have to do puzzels in between. Fun and excellent to keep you entertained. Rated 4 out of 5 by MN_BadGirl from Mahjong I have played this game several times and here is what I think. This is a fun game, the dialog is pretty silly and your kids could play this with no worries about language or what happens in the game. The only problem I had with the game is that I never seem to win the race at the end. I bet on two seahorses at a time and one of them falls down, even if it won the last race, or my horse just finishes last. It's pretty funny, but I hope you or your kids have better luck with those seahorses that are racing. ; > Buy it as a free game or when it is marked down. I am glad I did not pay full price for it. Rated 4 out of 5 by Zerotech from Not what I thought it was..... I'm basing this review on a first play-through in "Relaxed" mode. There is also a timed mode, which I think would remove the fun of the game. There are scenes which need to be painstakingly examined. I thought this was more of a kid's game, until I started playing it. The graphics are quite colorful and detailed, the story is amusing and basic (it put me in mind of the point-and-click adventure games of the 90's). 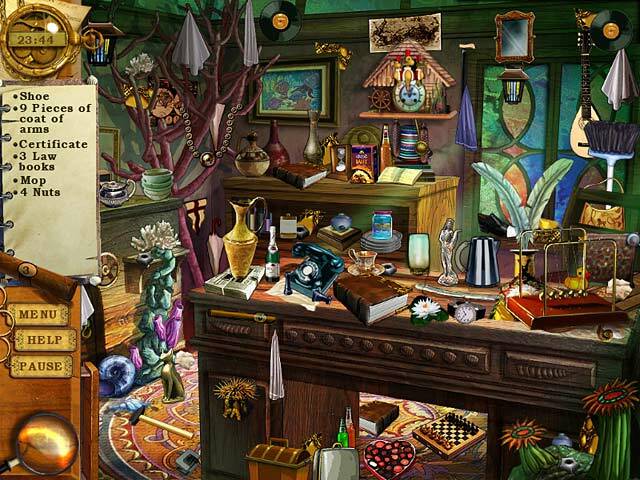 The hidden objects scenes are of the "complete the list" and "spot the differences" variety, while the mini-games are of the "put the puzzle pieces together" and "complete the sequence" types. Unfortunately, I had to skip through the "complete the sequence" puzzles, either they just didn't work on my computer or I wasn't doing them right. The game is very light on explicit instructions. Thankfully, you can skip the mini-games, if you need to, to get through to the next scene. If you're interested in beating a previous time, or beating all the mini-games for a higher score, I image you could play the game multiple times. If you're just interested in solving the mystery, you'll only play it once. A fun diversion; not bad, but not great.